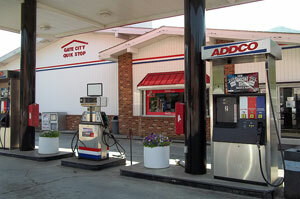 Addington Oil Corporation has four (4) convenience stores. They all offer a variety of grocery items, fresh hot coffee, cold drinks, plus health and beauty products. Each store also carries a variety of tobacco products (cigarettes, cigars and smokeless tobacco), plus gasoline, highway diesel, farm diesel. The Gate City Quik Stop and Weber City Quik Stop also offers K-1 kerosene. Pay at the pump is located at the Mid-Town Quik Stop, Weber City Quik Stop and the Red Roof Discount Cigarettes. Each store offers Lottery Sales.